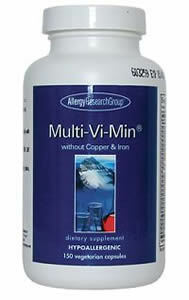 Same as formula as Multi-Vi-Min® Item #70170, except includes vitamin C and excludes copper and iron. Formulated by Stephen A. Levine, Ph.D. to be hypoallergenic, and many people who cannot tolerate a complex nutrient formula do well with the Multi-Vi-Min formulas. The nutrients in the complex are derived from the purest USP grade materials, which are ultimately synthesized from naturally occurring sources. For those with impaired digestion or absorption, vitamin B2 and B6 are supplied partially in their coenzyme ("activated") forms.